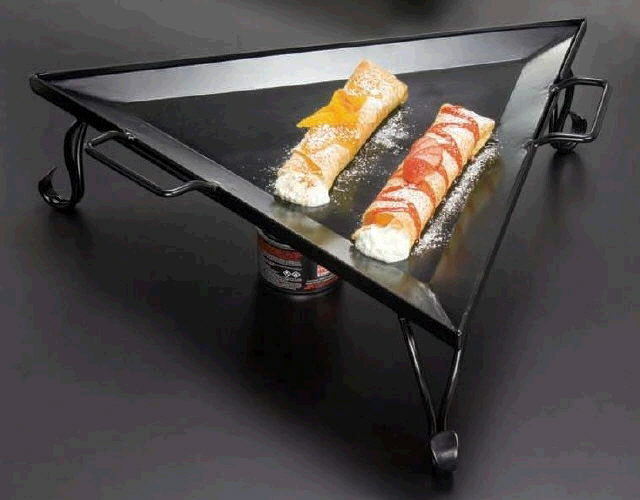 Great way to serve breakfast items, hot sandwiches, etc. Use chafer fuel cans to warm griddle. Griddle surface lifts from stand for easy cleaning and replacement. Ornate stand constructed from heavy gauge wire for elegant wrought iron look. Dimensions: 19-1/2" x 19-1/2" triagular x 6" high. * Please call us for any questions on our griddle ornate triangle 19.5x6 inch tall rentals in Ft. Wayne IN, Warsaw, Syracuse, Auburn, South Bend, Indianapolis IN.